"At the Third Beograd Tribunal, Mr. Klein was doubting the powers of the New World Order and look how he was taught a lesson ! The young man fainting in the middle of the picture, is an American student of whom The Great Leader has said 'Mr. Oswald will fire the first shot of a new era for us'" Yeah, okay. I got this quote and the two leftmost pictures from a Danish website manned by Balder Olrik. In a chapter called "The Incident," Olrik claims these and other photos came from a book he bought in Berlin, a book which was stolen from his house three days after he returned home. Fortunately, he had already reproduced these photos. What does it mean? "Nothing" is the safe bet, as he seems to be a graphic designer by trade and additionally has written, "Just don't mistake them for reality" in reference to the pictures in an update on his site. Still, even as fakes they are quite well made, and quite an improvement on the ectoplasm (ectoplasm being a substance drawn out of the physical medium's body by spirits or ghosts, and which could form into hands, talking voice boxes, all sorts of things) photos of yore. For example, the photos to the lower left are of a medium who apparently has the ghost of Arthur Conan Doyle (creator of Sherlock Holmes and a devoted Spiritualist) coming out of her nose. Seriously, that was the claim. 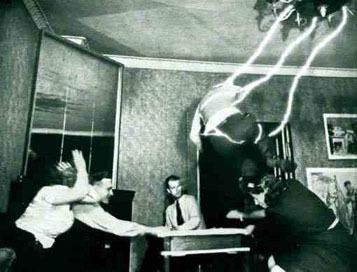 Physical medium Dorothy Henderson with ectoplasm coming out of her midsection (please note how there is no evidence that her hands--held by "controllers" in order to discourage fraud--have no evident relation to the rest of her body). 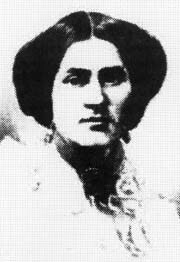 The Spiritualist Movement was begun in large part in 1848 with the Fox sisters, who produced rapping sounds and other noises which they claimed had a supernatural origin. Four decades later, they confessed to creating the noises themselves by snapping their toes and other joints, but this confession was rejected by their followers so after a while they took it back. By that time, the movement was in full swing and featured showmanship that has in large part been lost to contemporary practitioners. Mediums conjured spirits which spoke through aluminum trumpets, drew on chalkboards, painted portraits, and appeared in photographs. All of these phenomena were debunked by the likes of PT Barnum--who, though no stranger to fakery, drew a line at the exploitation of peoples' sorrow. Harry Houdini was another renowned critic of physical mediums, though at least one of his debunkings was later debunked. Pictured below is "Margery" Crandon, a Boston blueblood, wife of a Harvard professor, and the most famous medium of the 1920s. When Houdini locked her in a safe during a séance no spirits manifested themselves, but when she was released, out they came. 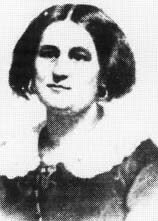 Houdini produced a collapsible ruler on the spot and claimed it belonged to Crandon, a charge she vigorously denied. Years after Houdini's death, an assistant of his told a reporter that he had planted the ruler for his boss to find. Although that is impossible to verify at this late date, Crandon was professionally compromised when one of the wax gloves left by the ectoplasmic hand of her dead brother Walter was found to have been imprinted by the thumb of a local dentist. Perhaps the best argument against the authenticity of the era of physical mediums is that they just don't seem to exist any more. 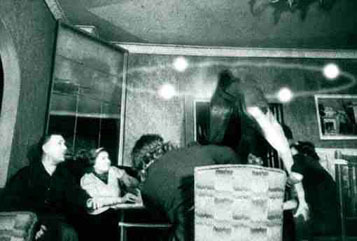 True, there are occasional displays of photographs of dead people mysteriously appearing on bits of cloth (which have been surreptitiously exposed to photo developing solution), followed by the perpetrators getting booked for fraud by the local police department, but the enormous crowds and fame formerly attracted by mediums has been copped by magicians. And what do we have in its place? Snapshots with orbs that look like water spots or specks of dust, and ectoplasm that looks like camera straps. Boring. Also, EVP, or Electronic Voice Phenomena. Interesting. EVP are strange sounds, some like spooky or even familiar voices, caught on audiotape but unheard at the time of recording. The first recorded instance was from Sweden in 1958 when a man named Friedrich Jurgenson said he taped his late mother's voice when all he meant to record were bird songs. A subset of these phenomena is Reverse Speech, in which language spoken extemporaneously is said to reveal deeper meaning (or the truth if it was Bill Clinton being recorded-that's not just a random slam, but an actual allegation by RS practitioners) when played backwards. 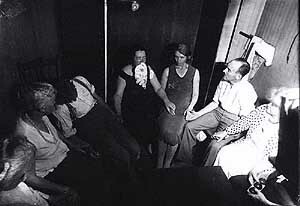 While it is possible that supernatural entities may possibly be reaching out using a previously unknown technology-and what the heck, the tapes are fun-we would do well to remember that contemporary critics of the first spirit photographs. They noted the ghosts depended upon glass plates and paper printing, but shunned earlier photographic forms like daguerreotypes, ambrotypes, and tintypes, so perhaps the technology had to evolve sufficiently to accommodate hoaxers rather than haunts. The American Museum of Photography: Do You Believe? 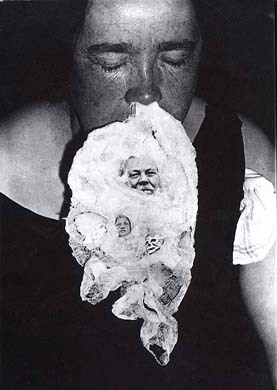 The woman above is Mina "Margery" Crandon, who specialized in conjuring ectoplasmic hands which would dip themselves in hot wax and leave hollow gloves like the ones above (if you look carefully, you can see a "third" hand reaching for the wax in the lower photo whilst the medium's hand are "controlled" by other sitters. I don't know what that thing in the corner is.